In My Vegan Garden: Vegan MoFo: Pie! Have you ever been to a pie potluck? I had never heard of a pie potluck and thought that I was a genius for coming up with the idea, but apparently they've been done before! Why a pie potluck you ask? Well, I LOVE pies, but they take too much time and patience to make for just a regular ole occasion, so I never make them. Well, it was my six year veganniversary last week, so I decided to throw a pie potluck in celebration. In addition to a big salad (we needed something green to go with all the pies! ), I made a pumpkin pie and the broccoli quiche from Vegan Brunch. The pumpkin pie recipe is one I've been working on for a while. I use the Libby's recipe from the can and veganize it. I've tried different things. This attempt came out a little too pudding-y, so I'm not going to post the recipe yet. The flavor was perfect, I just need to tweak the consistency. Matt made a raw fruit pie with a macadamia/date crust and cashew cream that was pretty wonderful. Other Portland MoFo bloggers were in attendance. You can read all about L&J's adventures in pie-making over at Of Capsicum & Things. Their blackberry/apple and mini pot pies were a wonderful addition to the potluck! Kittee has been keeping everyone on edge of their seats by releasing the secrets to her mulit-layer mini pies post-by-post. I wish I could have gone back for seconds, but everyone snatched up their portions and that was that. Also in attendance were Tommasina and Julian from Kale Them with Kindness. You can see Tommasina's beautiful blueberry lattice pie in the photos above. Julian made awesome apple hand pies that were being glazed when I was snapping photos. Panda With Cookie whipped up some super tasty peanut butter chocolate whoopie pies. Of course I didn't take photos of everything at the potluck. Suffice it to say, with 15+ folks in attendance, the potluck was pretty epic. Will do again! PS- Go win some beans by entering a giveaway posted by yours truly. I think a pie potluck is a genius idea and all of your treats look delicious. Nice to hear from you, Amanda! Oh it definitely was a good idea! Yeah- it's a good one! I'm pretty sure it was still genius. Happy veganiversary! Thanks, Panda! I'm glad you came! Yea! Pie potlucks are awesome every time. 'Cuz it's pie!! PIE PIE PIE! 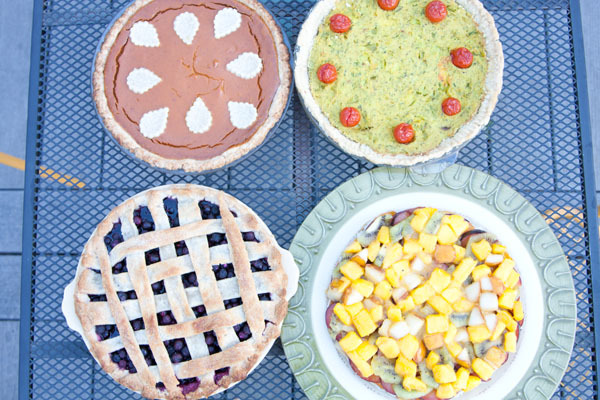 Almost as wonderful as the pies is the fact that you have so many vegan pie makers to invite to the party! 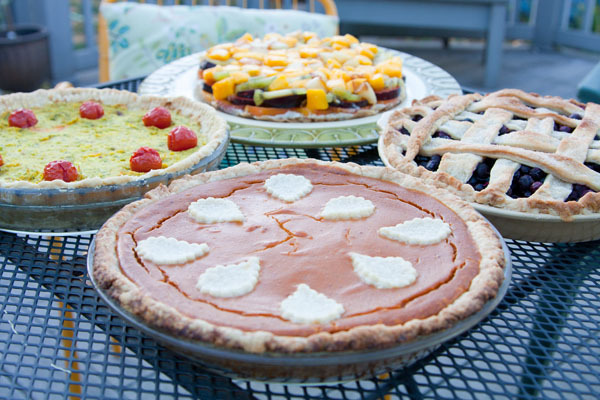 Such beautiful pies, too. Pie potluck?1?! seems like the best thing ever. Such great pie! Wonderful idea, and wonderful time :) BTW, did Matt use a recipe for his raw fruit pie or just wing it? He used a recipe from Going Raw by Judita Wignall for the macadamia cream and the nut crust. I had never heard of a pie potluck until now, so I think you are genius for throwing one. You are right though they take an inordinate amount of time to put together...but are so darn tasty. oh WOW! A pie potluck is such a great idea! I actually bought a half-sized pie dish so that I could make Half Pies. Because, with just the two of us, I can't really be making pies all the time. You know? a pie potluck? I want to go to there. Brilliant! I've never met a pie I didn't like.